← Headed south, far south. A busy month, nearly over for the year. As the Australian sailing season winds down, I’ve spent four weekends in a row out on the water both days running events. 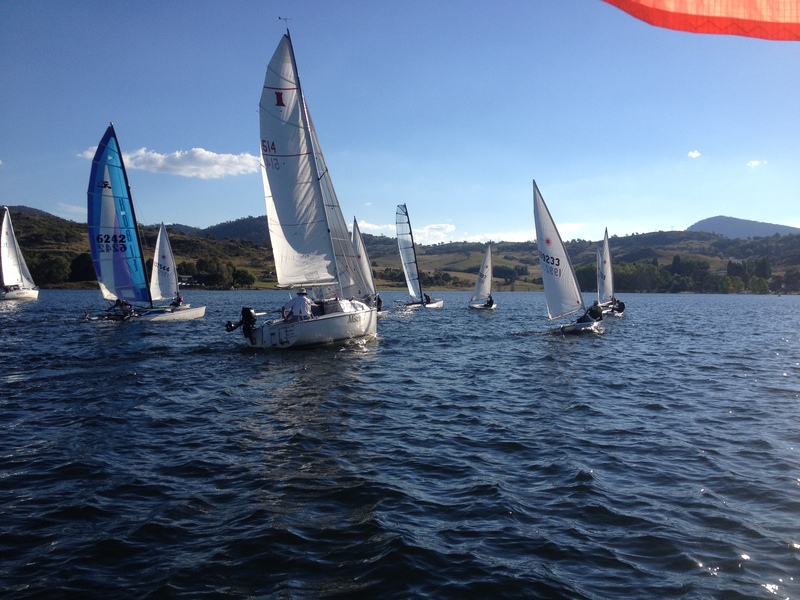 The first event was the Snowy Mountains Regatta down at Jindabyne, around 6 hours drive south of Sydney. This was the second year at Jindabyne and again the locals looked after me. 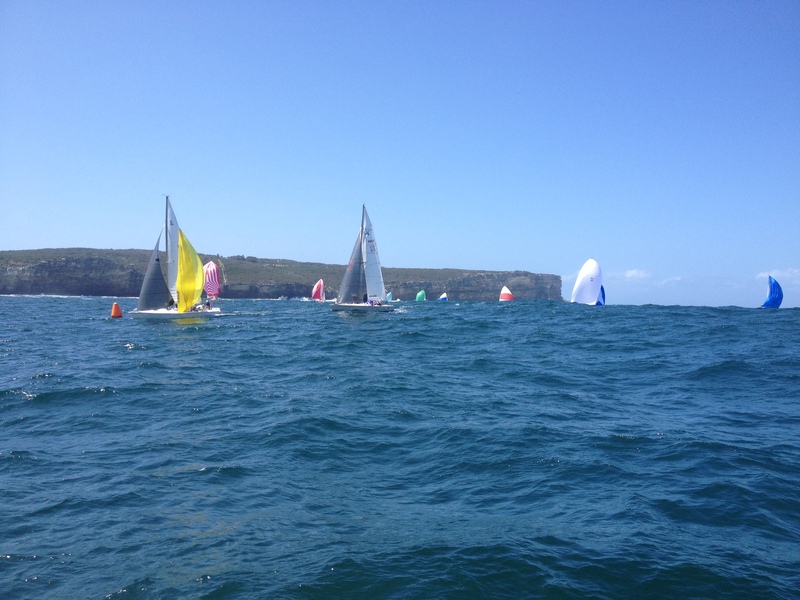 We had a mixed fleet of dinghies, catamarans and trailer yachts including a good fleet of 19 Lasers, some of whom had driven down from Canberra for the weekend. Friday evenings twilight race was held in a nice 5-8 North Wester around the laid club marks and everyone finished which was nice after last years evening storm. 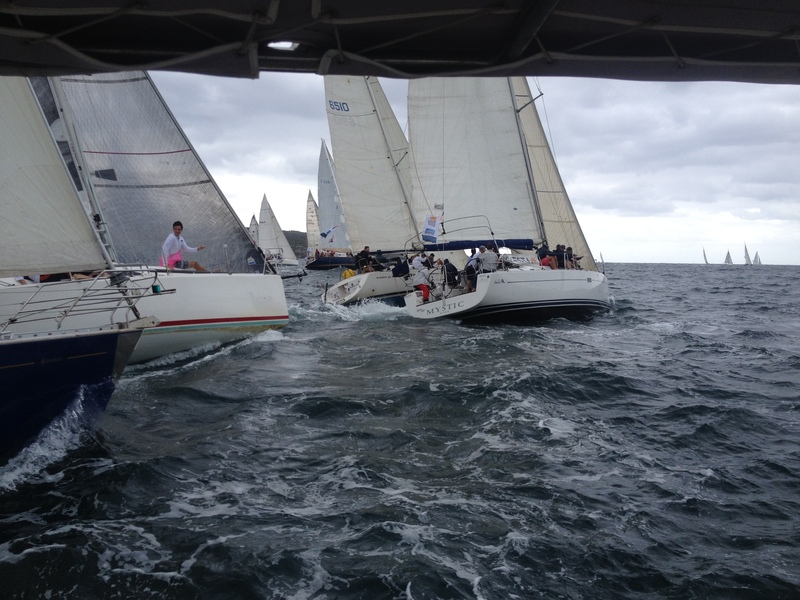 Saturday we had a good Easterly and ran several races, good stuff. 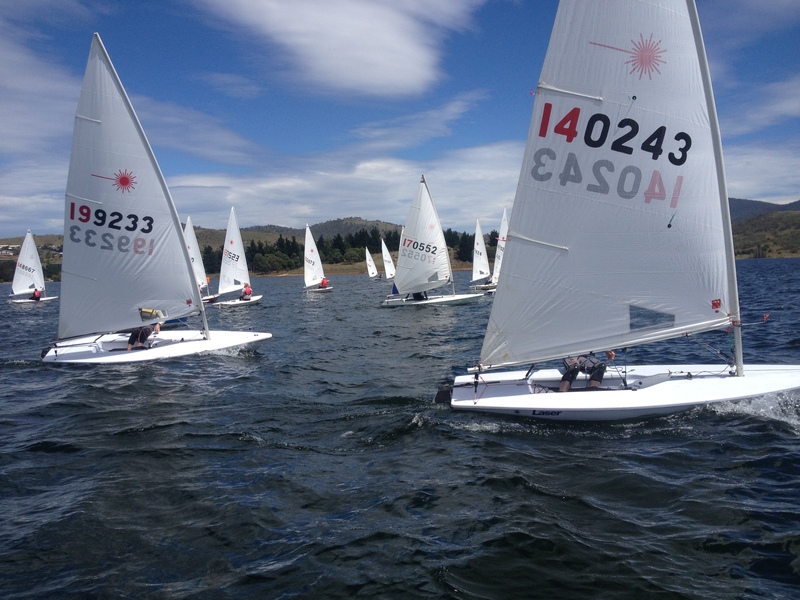 Sunday had the forecast 18-20knots Easterly and brought with it a short sharp chop on the fresh water Lake Jindabyne which made laying marks and holding anchor on the start boat difficult. The lake was made last century for the Snowy Hydro power scheme, drowning the original town so there’s a few no go areas as far as sailing and putting marks go. You may hook something harder than mud. 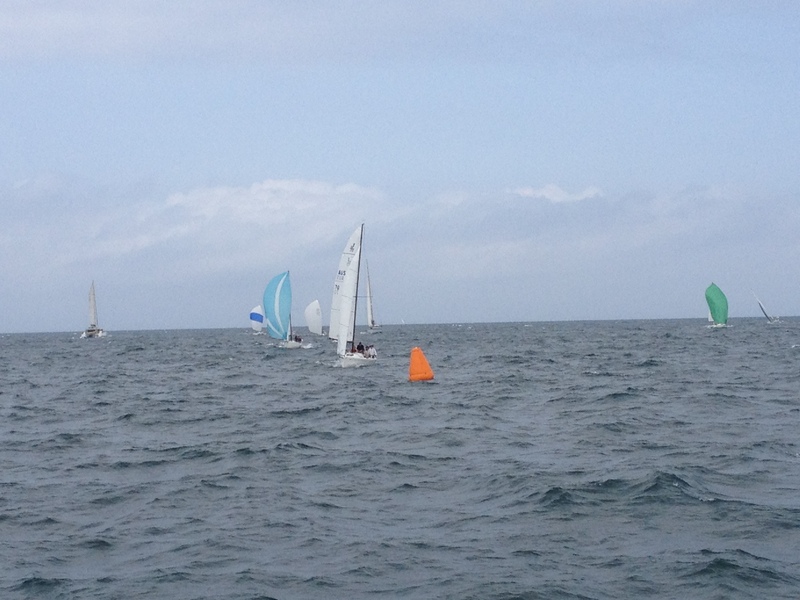 As the last competitors were finishing the last last, there was one young girl sailing a Laser on the last leg. She’d capsized multiple times and the last set was just short of the finish line. The rescue boat was off attending to a sinking Hobie16, so I asked the markboat to stand by her. Once the time limit expired, we came alongside to assist, she’d had enough and was starting to get cold, so we got her aboard. The only option was to jump in the water and right the Laser myself. The last time I’d sailed a Laser was a looooong time ago. After working out the vang and mainsheet were cleated off and releasing them, I had a pleasant 3 km sail back to the club. at least it was all one leg and no tacking! That’s one thing ticked off for a while, at least the water was fresh! 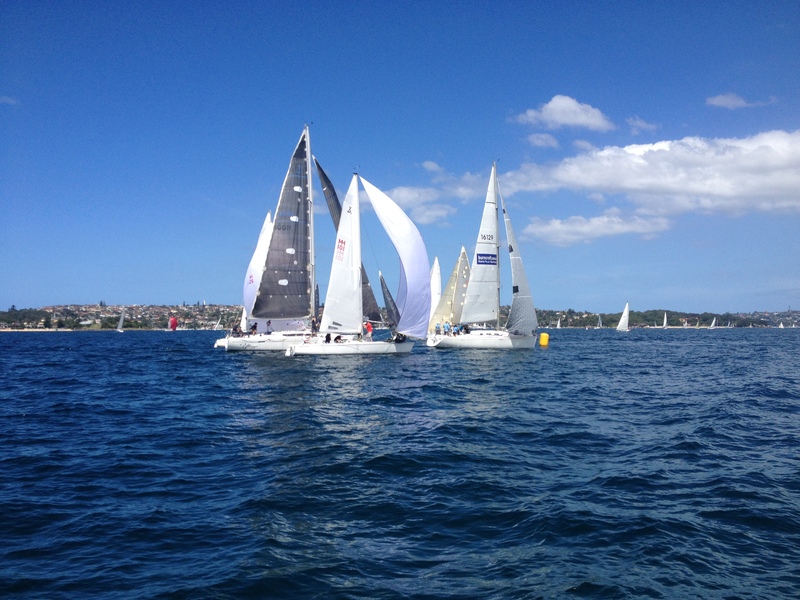 The next week end was the annual MHYC Sydney Harbour Regatta, so back to home base and running the Adams10m and the NSW State titles for the J70 Class. Saturday brought clear skies and finally a pleasant seabreeze of around 10knots. The main issue however was the runout tide, it was a big one. With the start boat laying across the tide and beam on the the breeze, it was a nasty day out rolling around all day. We had all sorts of issues trying to get a square start line. Sunday was far far better, the SouEaster of around 15knots was fantastic, still with a bit of tide but hey the startboat team were comfortable at least! Adams10s had their usual close racing and the J70s were shown around by my old Laser sparring mate Tony [Sir Arthur] Barnes. Sir Arthur was having his first hitout in the class on the demo boat and certainly hasn’t lost his touch on the helm. The next Friday was the Annual Property Industry Sailing Event, this huge fund raiser attracted over 90 entries in 6 divisions. 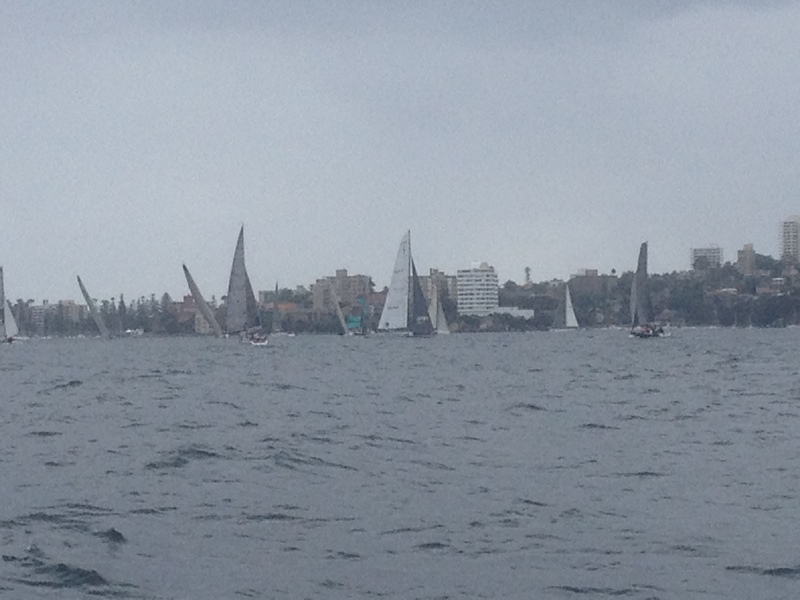 With a solid 20knots and drizzle at the start, I sent the boats off on the longer of the two options. 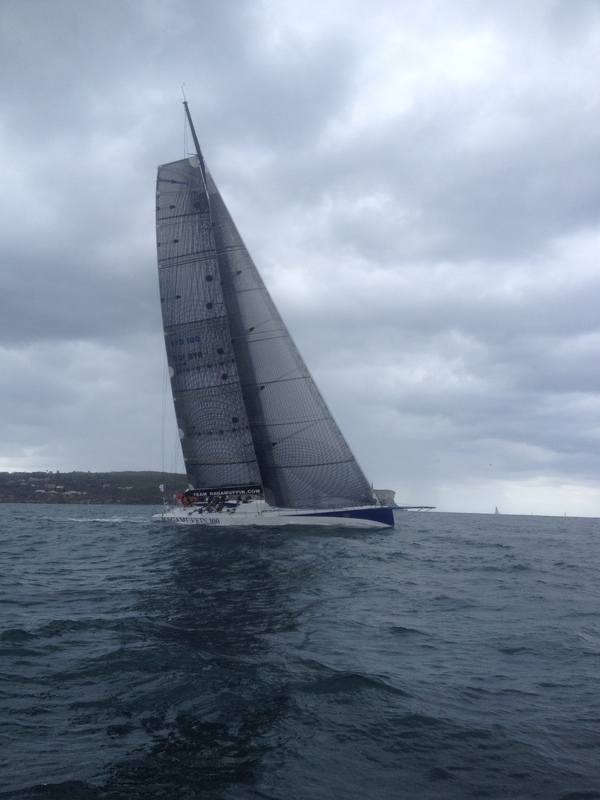 Ragamuffin100 sailed around the harbour course in under 2 hours! 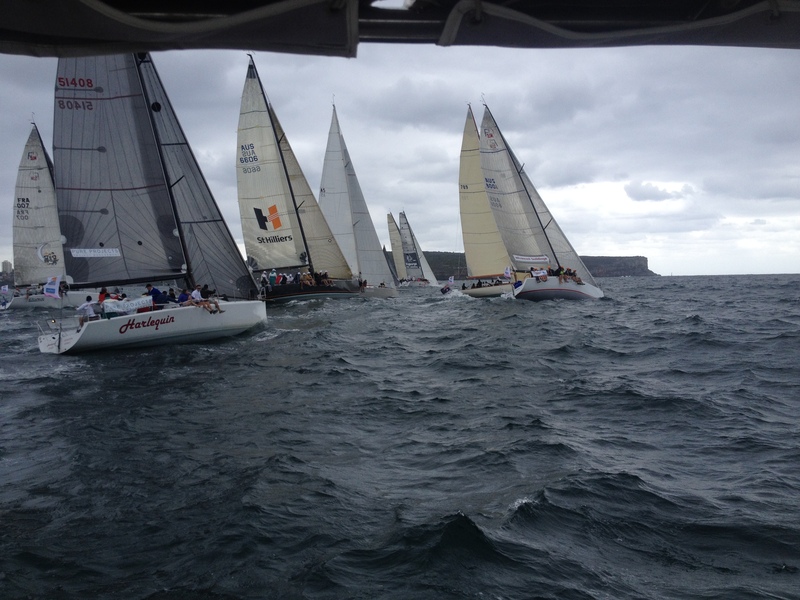 Unfortunately with the last boats needing to sail from Middle head to Shark Island and back the the finish in 90mins, the wind dropped out completely, nothing, nada, zip. We ended up with only half the fleet finishing, which no one could have predicted. Those I spoke to after, were also surprised at the conditions collapsing. The non sailors however enjoyed the day and that’s one of the main things. 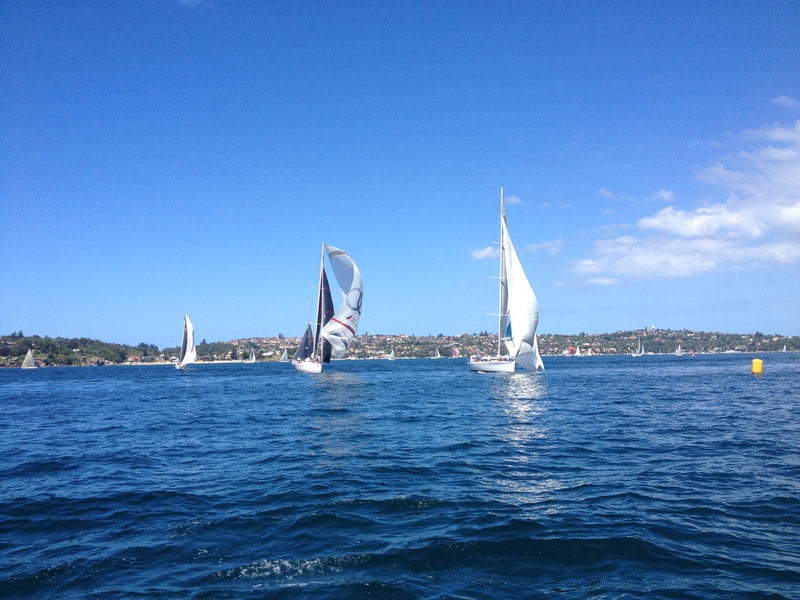 The following day was a joint club race with the RSYS big boats coming around to MHYC for the day. Whilst it was a nice day weather wise, the only option wind wise was to set a windward leeward course. 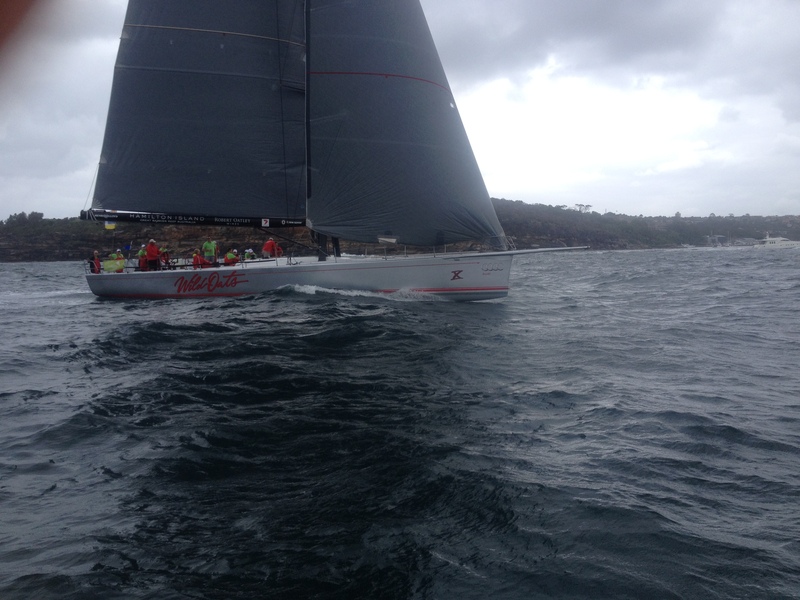 The smaller boats had it easy, however David Kellett aboard Sydney60 much preferred the longer legs than sprints. 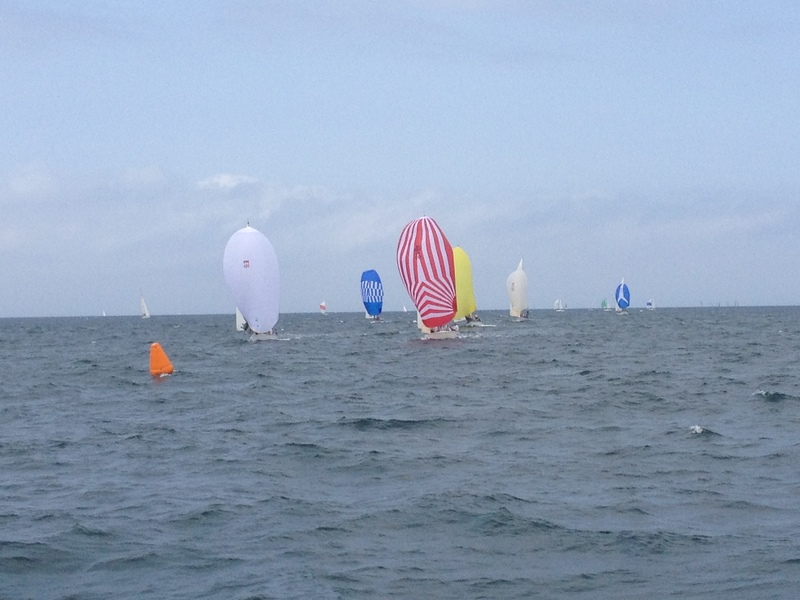 We got in two races in a nice seabreeze and I think most were happy with the day. Those who sailed the day before at least had a chance to dry out. Last of the full on weekends was running the NSW States for the 420s and 470s. With numbers well down due to clashes with other events both locally and overseas, the planned trapezoid courses were substituted for basic windward returns, which made it a lot easier on the volunteer [420 parents] mark laying teams. We got in all the races with time to spare, some made the comment that the races could have been a bit longer, but with only a handfull of each class, they were closer on the shorter courses. Spreading them out on longer courses would have seen a few of them sailing on their own most of the time. Last Saturday was the last club race for me this 2014/2015 Summer Season at MHYC. 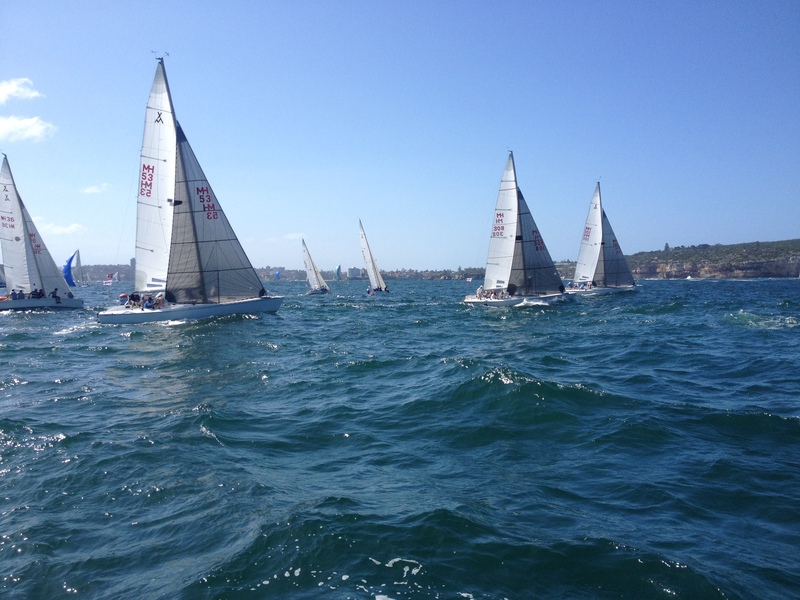 With the Combined High Schools sailing at Belmont16s after Easter and then the inaugural Sydney Sailboat Expo following, that’s it for the summer. I’ll be back on the road taking the DeckHardware van to Queensland, South Australia then Victoria in the coming months showing off an ever increasing range of products. Phil grew up sailing on Pittwater (north of Sydney) racing in many classes over the years including Manly Juniors, Lasers, 5.5’s, 505’s, several trailer Yachts, E22’s, 1/2 and 1 Tonners, A10m, Sydney 38’s and more. Phil is well known for his knowledge of boats, having built several classes and has a freaky ability to recognise boats and designs. 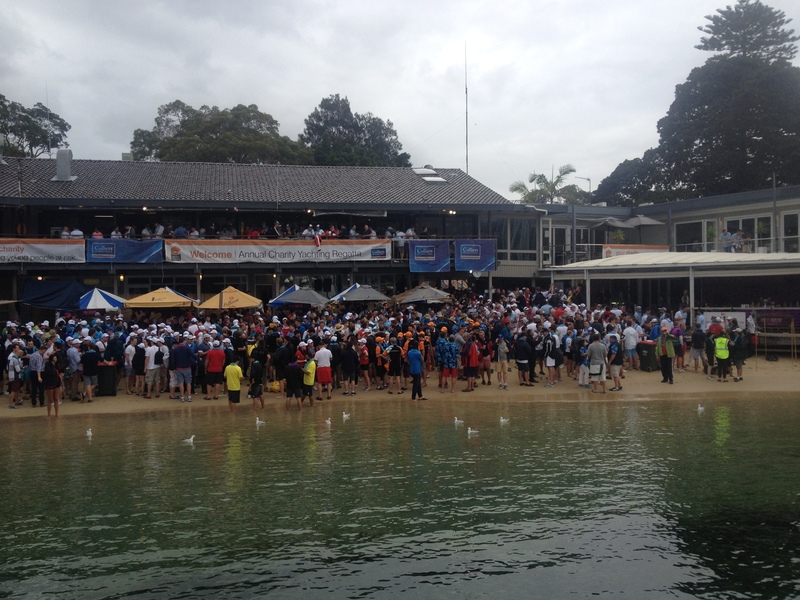 Phil is a National Race Official and Equipment Auditor (Yachting Australia).